March 26, 2011 - In an ongoing effort to improve aviation safety in Alaska, the Federal Aviation Administration (FAA) has turned on its 150th weather camera in Talkeetna, a historic village whose airport is the hub for mountain climbing and sightseeing flights to Mt. McKinley. Aviation cameras are positioned to view sky conditions around airports, air routes and mountain passes. They provide pilots with critical weather information to help them decide whether it?s safe to fly. ?Real-time pictures of current weather conditions from weather cameras are helping pilots in Alaska make better choices every day about when and where it?s safe to fly,? said U.S. Transportation Secretary Ray LaHood. ?We want to make sure people in Alaska can travel to work, school and the doctor as safely as possible.? More than three-quarters of Alaskan communities have no access to highways or roads and depend on aviation for access to food, mail, jobs, schools, medical services and travel. 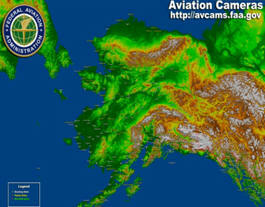 The FAA plans to install weather cameras at an additional 24 sites in Alaska this year and to have 221 camera sites in place by the end of 2014. ?Rapidly changing weather across Alaska?s rugged terrain can make aviation challenging,? said FAA Administrator Randy Babbitt. ?Weather cameras act as eyes in the skies for pilots and have become a critical part of aviation in Alaska.? In addition to helping prevent weather-related accidents, the camera program can help aircraft operators save fuel by eliminating situations where pilots take off only to find they have to return due to bad weather. The FAA started the Alaskan Aviation Camera Program in 1999 after determining that pilots operating under Visual Flight Rules would benefit from actual views of current weather conditions. Camera images are updated every 10 minutes and are disseminated to the public through the FAA?s aviation camera website at http://avcams.faa.gov.